Every year Accademia Romana Kendō organizes a stage held by its shihan, Master Masashi Chiba (8th Dan, Hachidan Hanshi), to whom any dojo or person interested is invited. Translation in Italian by Emanuela Pirola. Adaptation by "Circolo Jōdan Villa Pamphilj". Fifty years. 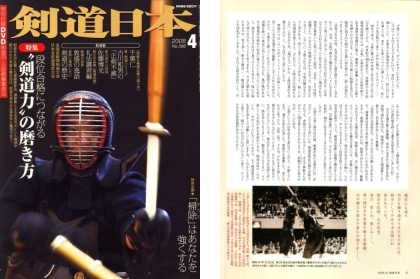 Half a century has passed since Master Chiba Masashi held for the first time its shinai the first year of middle school. 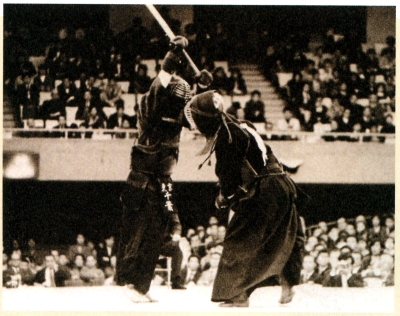 At the times of Kogota Nōrin High School, in Miyagi's prefecture, where he received a strict formation, hardly training in the classes held by the legendary kendōka Nyūi Yoshihiro, named "White Demon", and even after entering the metropolitan police of Tōkyō, presented by several famous kendōka. As the speech goes on flashbacks comes by one after the other. "The third year in High School master Nyūi told me to devote to jōdan, and since than after having training kakarigeiko in chūdan until collapse he used to tell me: "Now raise!" and he made me strike two hundred times. While telling me: "What is that way of hitting?" he used to make my shinai flying from my hands. It didn't take long until, from a first fascination for jōdan I arrived to say: "Sensei, chūdan is enough for me". Hearing those words Sensei used to get mad at me telling me: "What!!!" and he use to repeatedly strike tsuki on my mune. I was scared, I was scared but there was nothing I could have done and, feeling humiliated any time Sensei hastened me with a degashira men he used to tell me: "It is this, jōdan is this very feeling". And he used to repeat: "Running away is miserable, jōdan is winning through aiuchi", I thought: "Ah, it is so, then". In Tōkiō at Keishichō every day was a battle against the pressure suffered. Having won very young the national championship (Zen Nippon Kendō Senshuken Taikai), everyone expected from me to win always. Despite I refused to retire and I stayed in Tōkiō, sometimes, if I had a place to run, I'd have left Keishichō and run back to the countryside; I though about not having anymore championship to do and I used to moan, and moaning sometimes it happened to me to stay awake all night long. From awakening I used to think: "Will they get mad at me even today?" Kirikaeshi, kakarigeiko.. when I used to get in where we trained my leg would not move, paralysed. Nevertheless, when it was time for shiai my mind changed and I was only thinking: "I have to do this", "I have to win". I spent my whole like as an athlete always having this sense of duty." He won the national championship three times. At the age of 34 he retired from an athlete life covered in glory. Making a new step forward, as a hanshi, master and guide. "There is a strictness as a high school student for high school student, a strictness as adults for adults. A master has to keep on following its own road alone and keep on practising. To teach, apart from the ability to guide, it is necessary a type of practice which may become a model and even have a specific behaviour. Training oneself to gather instantaneously any chance hitting with steadiness, and this needs to be don with honesty. Every day is a fight against ourselves. It is necessary an effort so huge to have confidence in ourselves, that only we can do it, not someone else. In Kendō, in practice, the best thing to do is to train in the dōjō because "experience is necessary to obtain a deep knowledge" (Japanese way of saying). But the confidence that in this way it is obtained is then transformed in kindness once in front of the opponent." In the joint of index and little finger in the part in which it is held the tsukagashira, kendoka typical hardness remains, hardness which could also be called "shinai's callus". Nevertheless the surface is smooth and delicate. We have here the hands of an expert which seem to have left apart anything useless. "Today I understand that for human beings there is no peace until death. I thought that once retired from my life as an athlete and Keishichō in Tōkiō I could have rested… not at all (he laughs). Anyway it is pleasing. One day in which, light-hearted, I do not train I do not obtain anything and it is boring. I feel better the days I do train. I even like drinking sake and eating. And when I speak to the other I am able to make conversations feeling comfortable with myself. Since Kendō has become the rhythm of my days, better, of my whole life, I do thing it is difficult to get by an existence without kendo. I do not think there will be any from now on and that I should keep up with Kendō. Since it is in this way I do feel full emotions." On those hands that hold for many years the shinai are impressed all the memories as a kendōka, memories of shiai, the confidence in himself, the joy, the pain and the fun… the first chapter written in the hands of Master Chiba Masashi, expert in fire kamae, tell us of the three victories at the National Japanese Championship. In the picture above: Master Masashi Chiba in meditation..